The function of the Digital Board is to decode the data from the band switch and produce the frequency range data which is then sent to the frequency synthesizer. The frequency synthesizer takes this data and produces the corresponding tuning range of the transceiver as determined from the band switch setting. This board also controls the switching between the "Normal" tuning ranges and the tuning range input from the AUX Program Board. The AUX-7 Board is an accessory board that accommodates the programming for up to eight additional 500Khz tuning ranges for transmit and receive functions. The board also supports up to eight channels for fixed frequency operation. All tuning ranges and fixed channels are selectable from the front panel "AUX Programming" switch. The eight 500Khz tuning ranges are programmable using the plug-in diode array modules. 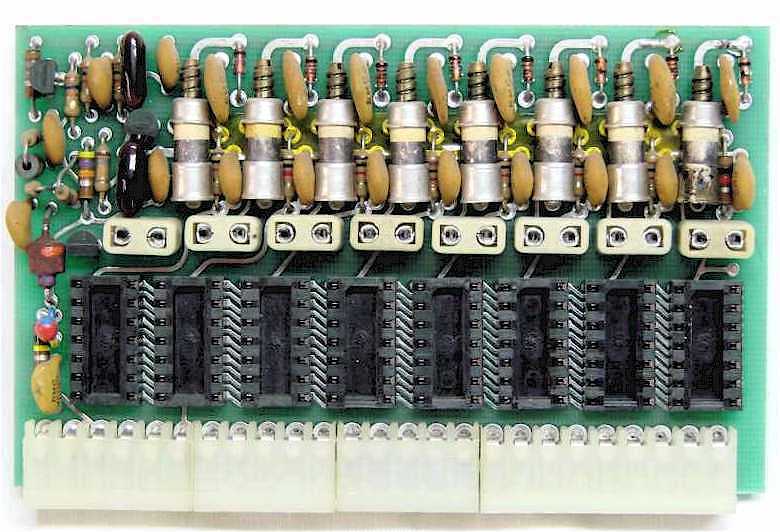 Each of the eight fixed frequencies are crystal controlled by installing the appropriate crystal on the board. Each crystal position has an individual trim capacitor to zero in the correct frequency. The Digital Display Board provides two major functions for the transceiver. First it provides full frequency coverage for all frequencies from 500Khz to 30Mhz and generates the frequency range data beyond the Amateur Radio bands. Second, the board displays the operating frequency in a digital format. Both functions work independently of each other, a failure in one section does not affect the other. 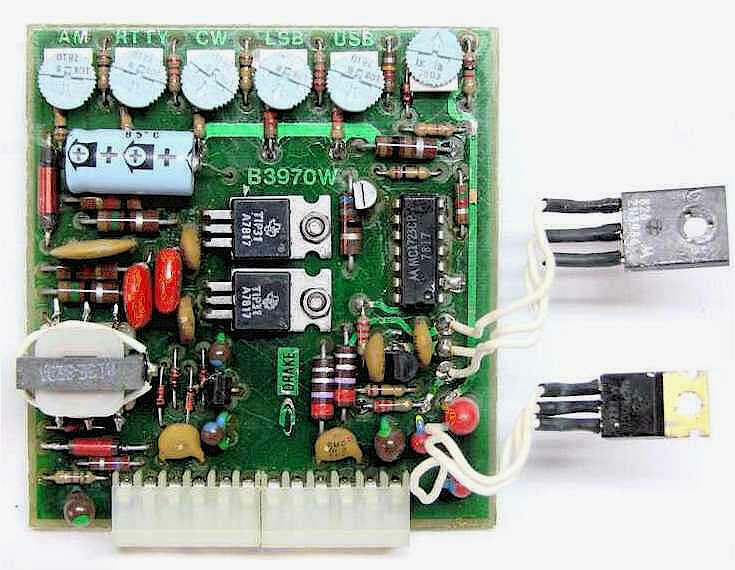 This board mounts over the top of other circuit boards plugged into the Parent Board. Because of the board size and mounting makes this board very difficult to remove and replace. The board must be precisely placed to fit the front panel display and align the pins on the bottom side. 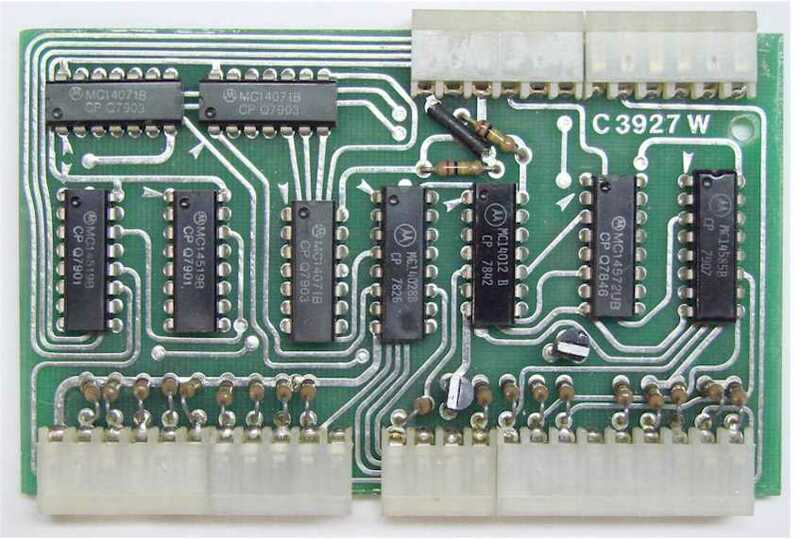 Take care when removing or installing this board, its very easy to misalign the bottom side pins. Applying power with this board not properly installed could cause significant damage to the board and the transceiver. The Power Supply Board takes the primary input power, typically 13.8VDC, and outputs four different voltage levels. The +10VDC and +5VDC outputs are internally regulated on the board. The +24VDC and the -5VDC are unregulated and are produced from a DC to DC inverter circuit running at 23Khz. 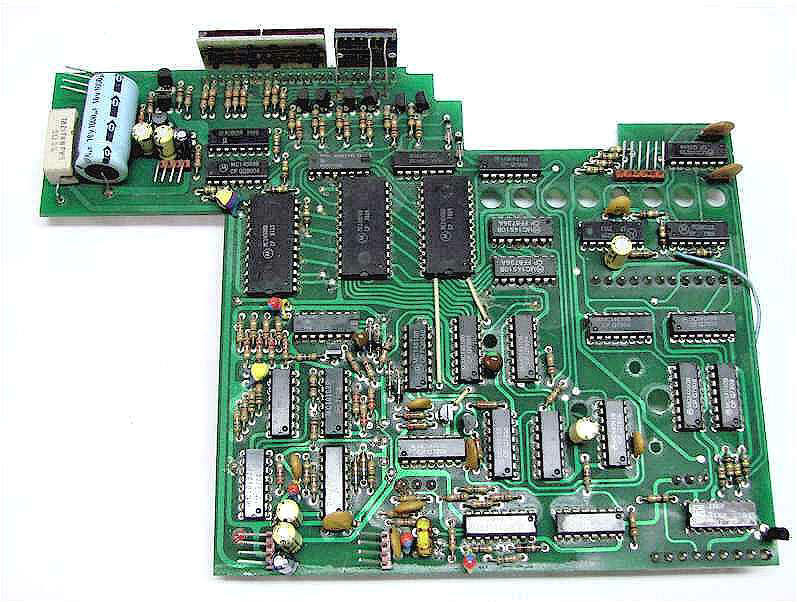 This DC inverter circuit included the two board mounted transistors in the center of the board and the small transformer on the right side near the bottom. The Power Supply Board also contains the voltage divider adjustments for the fixed pass-band tuning control lines. These adjustments are the transceiver mode fixed frequency off-set adjustments that fine-tune the offset to the exact frequency. There are separate frequency adjustments for the AM, RTTY, CW, LSB, and USB modes.